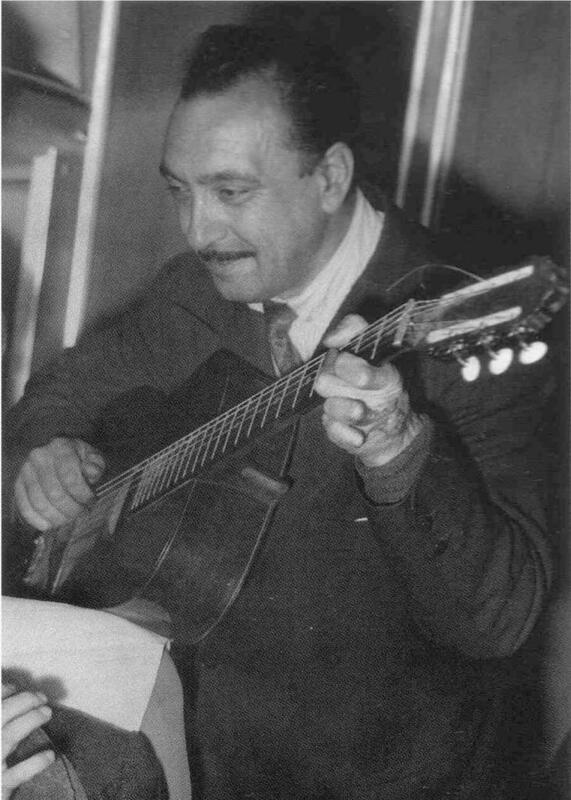 By the early 1950s, Django Reinhardt was very much a “yesterday’s man” and as far as we know, had not worked with Hubert Rostaing since a concert in Brussels in December, 1948. I have always felt these two factors make this set of photographs particularly intriguing. In addition to Django, the people featured are Hubert Rostaing, Line Renaud, her husband Louis “Loulou” Gasté and Pierre Guillermin. Like so much about Django, the exact date they were taken is in some doubt. Several years ago, Line Renaud told me they were taken in 1951 just before her first visit to the UK. However, an article in a 1955 issue of Marseille Magazine states very specifically that it was 24th November, 1952 before a flight to Italy. Since Line Renaud was in her early 80’s when she gave me that information and much had happened to her in the intervening years, I think I would tend to go for the 1952 date. Also most of the dates she has given elsewhere relating to Django are incorrect. The key indicator in the photographs themselves is the shape of Django’s moustache, very 1952/53. So we have Django involved in what can surely only be a pre-arranged Line Renaud publicity “photo opportunity” at a time when nobody was really interested in him. To further confuse the issue, he is accompanied by a musician with whom he never or seldom played anymore because Rostaing’s more conventional swing style no longer fitted in with Django’s bebop aspirations. The question is why? Django was normally too unreliable to do this sort of thing and according to one article I read, the flight was an early morning departure (it certainly looks dark outside) and as we all know, Django simply did not do mornings!!! The official story is that Django and Rostaing turned up unexpectedly to see Line Renaud off and wish her every success with her tour. That seems highly unlikely to me but there was considerable history between Django, Louis Gasté and Line Renaud which could shed some light on the origins of this session. Gasté was a band guitarist who initially played with Ray Ventura’s orchestra and then went on to be a successful composer; his most famous composition being "Pour Toi" which later became “Feelings” and was recorded by many people including Frank Sinatra and Elvis Presley. He met Django in the early/mid 1930’s and in 1937 they recorded two classic pieces together “Bouncin’ Around” and “St Louis Blues”; the only time we hear Django with a non-Hot Club style rhythm guitar accompaniment. According to the information Line Renaud gave me, they (Gasté and Django) were good friends and often jammed together – Django frequently using Gasté’s guitar, one of which was a Selmer. Louis Gasté had met Line Renaud in 1945 when he was 37 and she was 16. He immediately became her “Svengali” and they were married in 1950 and perhaps somewhat surprisingly, remained together until he died in 1995. Line Renaud always speaks very highly, almost whimsically, of Django saying how he helped her with her phrasing, delivery and breathing. Whenever asked about him, she mentions the time she, Gasté, Rostaing and Django appeared on Maurice Chevalier’s “This is Paris” radio show which was recorded in Chevalier’s Cannes home. She says it was 1946 but all the indications are that it was actually 1949 (there is an acetate recording of Django playing “Night & Day” with the Paul Baron orchestra from this show). She talks lovingly of those regular smoke and whiskey fuelled train journeys from Paris to Cannes for the program during which Django and the other musicians jammed continuously. Perhaps, in reality, not so regular though as Daniel Nevers claims Django and Line Renaud only appeared in the first “This is Paris” program. By 1952, when these photos were taken, Line Renaud’s career was beginning to take off and she went on to become a successful singer and actress. In fact, she was one of the stars of “La Route du Bonheur”; the only known feature film in which Django appeared. I can verify her success was truly international as I clearly remember seeing her regularly on BBC TV programs in the 1950’s although, at the time, I had no idea she had ever had any connection with Django. 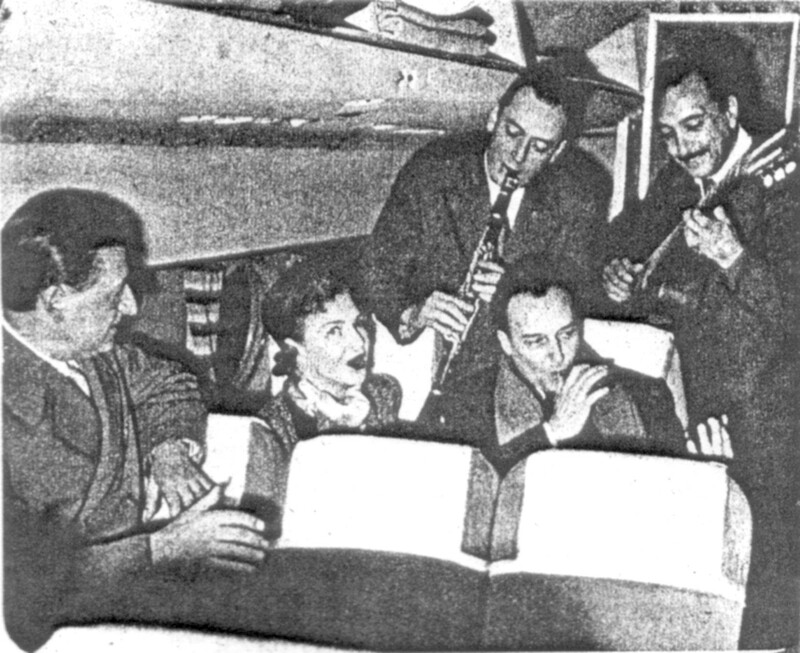 The realisation that Hubert Rostaing travelled with Django to Cannes for this program or possibly these programs, depending on who you choose to believe, indicates that they did in fact have some contact after 1948 even if it did not involve them actually playing together in a formal sense. Django fans probably think Rostaing’s heyday was performing with the maestro in the various 1940’s Hot Club Quintets but although that may have been true musically, he went on to far greater things in terms of his own career, and certainly financially, after he and Django parted company. Both Django and Stephane Grappelli were incredibly miserly towards their sideman. Rostaing famously argued with Django about money and left the new Quintet in disgust because of the way he was being treated although he did return intermittently later. Roger Chaput had left the string quintet several years before for the same reason (great fun he said but financially a disaster). By the late 40’s, Rostaing had progressed to being a band leader in his own right; his band having equal billing with Django in the early 1950’s “La Route du Bonheur” movie. Later, he moved away from jazz and became a successful arranger, specialising in film scores. For completeness, the final member of the group is Pierre Guillerin who was a band leader, orchestrator and pianist and, it seems, Line Renaud’s pianist and arranger for a while. Another point of interest is what guitar is Django playing or pretending to play (no plectrum) in these photos? Is it his? Is it Gasté’s? Is it something that was quickly rounded up for the shoot? It certainly does not look like any guitar we have ever seen him play and the chances of Django actually bothering to bring an instrument along for a session like this seems extremely unlikely. Had he done so, it would have surely been his Selmer. So my guess is that it probably belonged to Louis Gasté and therefore, is of no real relevance to us. So the photographs here are clearly publicity shots and the real star is Line Renaud, not Django. The positioning in the external photograph is particularly significant with everyone being grouped around Renaud as the centre-piece. If this is so, why was Django invited? At that stage in his life, what did he really add? The truth is that Django’s career was very much in the doldrums and he had been abandoned by all but a few jazz fans whereas Line Renaud, Louis Gasté and even Hubert Rostaing were moving on to bigger and better things. Perhaps the reality is that Line Renaud and Louis Gasté were the ones doing Django a favour by inviting him along for old times sake rather than Django helping them with their publicity. Whatever the reason, Django does seem genuinely pleased to be there at a time when he was often an unhappy, even bitter man. So my earlier supposition may be wrong – there was no reluctantly received invitation and it is true, as claimed by Line Renaud, that Django gleefully gate-crashed her publicity shoot to wish her bon voyage (possibly on his way home early in the morning after a late gig or even just jamming through the night). Anything is possible because Django Reinhardt was certainly nothing if not totally unpredictable. Thanks to Francois Ravez and Marc Masselin for help in trying to establish the real facts rather than the supposition we often read about Django. 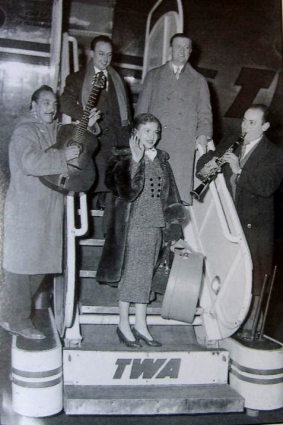 Django travelled to the UK in 1934 by plane with Jean Sablon, André Ekyan, Peddy Nyles, Alec Siniavine. Unfortunately, I have not been able to include all my best quality photos of this session as they have only restricted use. Posted by Roger Baxter on July 11, 2014 at 9:22 pm in Uncategorized.1 Comment.